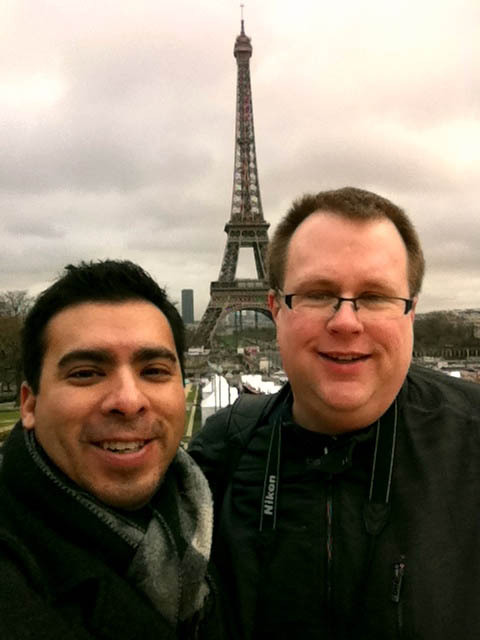 Francophile Bob Adams (on the right) fell in love with the City of Light during his first visit at age 12 and has begged, pleaded and pestered his family, friends and coworkers to travel to Paris with him ever since. To date, Bob has visited Paris 10 times, including three long stays: One month in the 2nd Arrondissement near Rue Montorgueil, a one-and-a-half-month stay on the incomparable Rue de Sevres in the 6th Arrondissement, directly across from the storied Le Bon Marche department store, and his most recent trip, a six-week stay in a funky studio directly across the street from the gorgeous Tour Saint-Jacques in the 4th Arrondissement. A journalist who has worked for newspapers, magazines, digital media and corporate communication departments on both U.S. coasts, Bob never turns down a chance to visit Europe for work or for fun and has frequented such incredible destinations as Amsterdam, Brussels, Copenhagen, Geneva, London, Monaco, Munich, Prague, Rome, Salzburg and Vienna, as well as sightseeing throughout France. He lives with his talented pastry-chef husband Joseph Olivas and his beloved dogs, yellow lab (Beetle) Bailey and terrier mix Lucy (Caboosey) in Los Angeles. Bob is the author of “LGBT Paris: A Gay and Lesbian Travel Guide to the City of Light,” a completed manuscript currently being pitched to literary agencies across the country.